Today is our housewarming party, so that means chores, chores, and more chores for me. I figured I could still have a little ham radio fun by firing up WSPR and letting it run while I took care of stuff around the house. I didn’t really expect it, but my little 1 watt signal to the random wire is managing to haul itself to nearly the other side of the globe this morning. 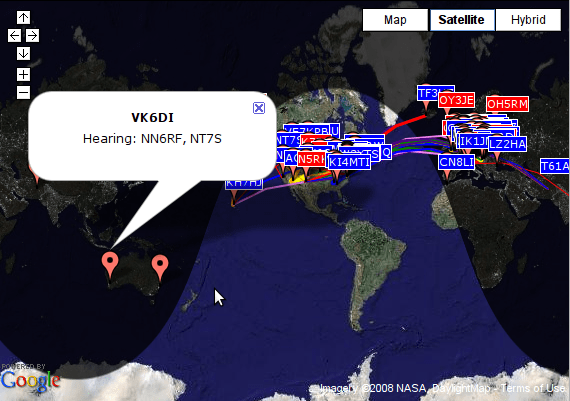 Both VK6DI and VK2AWD have been receiving my signal fairly reliably. I was hoping that I could hear a VK station here in Beaverton, but it doesn’t appear that either of those two are set up to transmit. Regardless, it’s still really gratifying to see your modest signal make such a spectacular trip. Here’s a screen grab of the latest spots of me uploaded to the spotting page. I’m hoping to run my WSPR beacon a bit more over the next few months at various times of the day to try to get a better picture of what propagation is like at my QTH. I’ve been so constrained in my HF operations in the past, I’ve never really been able to count on working any DX and I have no grasp of what the propagation characteristics are like (other than the generic characteristics of each band). Neat stuff for sure, and I would like to try other bands. However, I think I’m going to stay off 40 meters until the agreed-upon frequency is changed. Right now the WSPR watering hole on 40 meters is just about smack dab on the QRP frequency, much to the chagrin of a few QRPers. I can’t say that I blame them, I don’t think that was the wisest choice. A lost of WSPR participants run 5 watts, so it’s not like these are microwatt beacons we are talking about. In the mean time, I’ll continue to have fun on the other bands. Geez whats your secret, I have yet to be heard on 30 WSPR. I run 5 watts, 10watts, have even gone up to 30 watts, nothing nada zip. I can switch to PSK at 5 watts and make contacts. I’ve ran this mode for hours now. I have the rig set on 10.386.7 just like it says to do, USB Data and nada. Keep up the good work Jason.